Sketch construction techniques. Address the issue that feature vectors of feature-rich data objects are high dimensional. The goal is to develop practical algorithms to construct sketches to substantially reduce the dimensions and sizes of feature vectors while achieving high-quality similarity searches. Efficient filtering and indexing methods. Indexing and filtering large feature-rich datasets are challenging because noisy data require similarity match and similarity search and indexing data structures for exact match do not apply. The goal is to investigate novel data structures and algorithms to filter and index for similarity search of large datasets. Similarity search of multiple data types. Develop understanding of similarity search of various data types including images, audio, video, 3D shapes, scientific sensor data and documents. We are also interested in continuous archived data and data with multiple modalities. Toolkit for similarity search. Most similarity search efforts are domain specific. 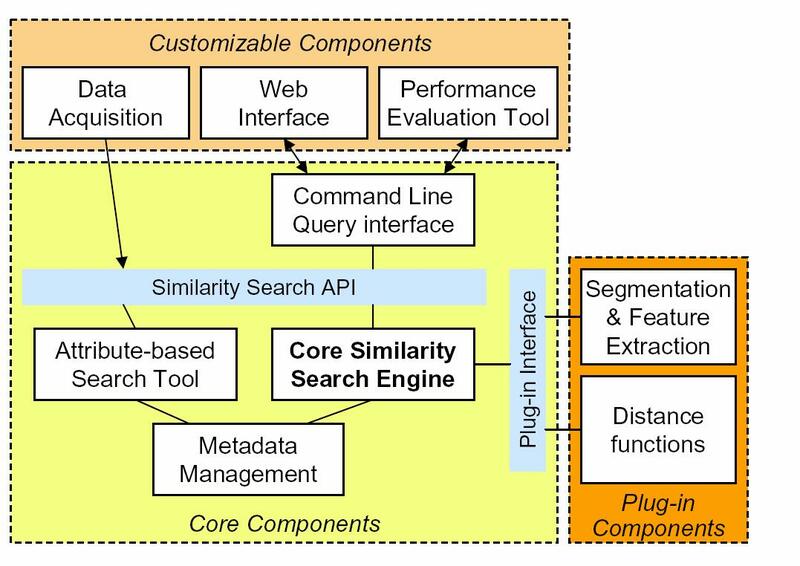 Our goal is to design and implement a toolkit that can be used to construct search engines for various data types by plugging in specific data segmentations, feature extractions and distance calculation modules. We have built an initial toolkit called Ferret which has been used with four data types including images, audio recordings, 3D shapes, and genomic microarray data. Below is the architecture design of the Ferret toolkit. Click here to see some demos and snapshots of the search systems built using the Ferret toolkit.